Welcome to the Conjunction of Venus & Jupiter Challenge! The first Challenge of the 2019 Challenge series is a 15 day challenge to celebrate the Conjunction of Venus and Jupiter. The challenge is being offered on the Seventeen or Bust LLR (SOB) application, working towards solving the Sierpinski Problem. To participate in the Challenge, please select only the Seventeen or Bust LLR (SOB) project in your PrimeGrid preferences section. The challenge will begin 7th January 2019 05:43 UTC and end at 22nd January 2019 05:43 UTC, time of closest angular separation. Note the non-standard start time. Highly overclocked Haswell, Broadwell, Skylake, Kaby Lake or Coffee Lake (i.e., Intel Core i7, i5, and i3 -4xxx or better) computers running the application will see fastest times. Note that SOB is running the latest FMA3 version of LLR which takes full advantage of the features of these newer CPUs. It's faster than the previous LLR app and draws more power and produces more heat. If you have a Haswell, Broadwell, Skylake, Kaby Lake or Coffee Lake CPU, especially if it's overclocked or has overclocked memory, and haven't run the new FMA3 LLR before, we strongly suggest running it before the challenge while you are monitoring the temperatures. The first time BOINC downloads an SoB task, it may act a little strange and download 4 tasks instead of 1. The run times on this first set of tasks may look a bit strange too. This is normal. This will also occur anytime BOINC downloads more than one task at a time. This can be avoided by setting "Use at most [ 1 ] % of the CPUs" before you download SoB tasks. After one task was downloaded, increase the percentage. Scores will be kept for individuals and teams. Only tasks issued AFTER 7th January 2019 05:43 UTC and received BEFORE 22nd January 2019 05:43 UTC will be considered for credit. 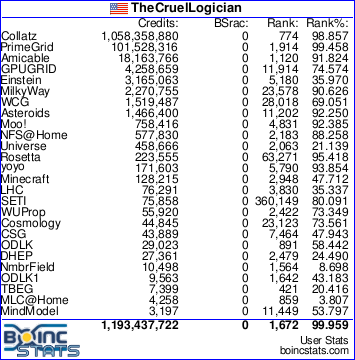 We will be using the same scoring method as we currently use for BOINC credits. A quorum of 2 is NOT needed to award Challenge score - i.e. no double checker. Therefore, each returned result will earn a Challenge score. Please note that if the result is eventually declared invalid, the score will be removed. • Louis Helm, a computer engineer in Austin, Texas. • David Norris, a software engineer in Urbana, Illinois. • Michael Garrison, a Computer Science undergraduate at Eastern Michigan University in Ypsilanti, Michigan. We’ve currently in the n=26-29M range, with most of the tasks around 8.6-8.7M digits long. Any prime found would come in as the 11th largest ever. Next tasks after that are n=29-30M, with a small bump in length to 8.7-9.0M digits. We're well beyond the point where the Seventeen or Bust project thoroughly double checked their work, so finding a missed prime is a possibility. Two of their primes were found while double checking their prior work. Will we find a third? 10223*2^31172165+1 by Szabolcs Péter (SyP) on 31 October 2016. Official Announcement. Previous to that the last SOB candidate was eliminated in 2007. Forwarded the information to the Rechenkraft.net forums. As for the rest of the challenge series for 2019, the duration is far too long (as is this one). 3-7 days should be the norm, less those who only participate in your project to be a team player for their team get burned out, or just ignore the challenges altogether. Can you tell us what the current FFT size is for this project? It would help with figuring out the best multithreaded configuration. Message 124111 - Posted: 1 Jan 2019 | 22:09:57 UTC - in response to Message 124110. The answer to your question will be different for each K, so I'll have to give you 5 sets of values. There's a small number of 2304K and 2400K SoB tasks currently being crunched. If any of those tasks fail, they'll be recycled and sent out again, so it's possible some of those could be sent out during the challenge. It shouldn't be a lot of tasks, however. The vast majority will be 2560K or 2880K. Also, the general caveat about FFT sizes: your mileage may vary. Your computer may choose a different FFT size than what the server's calculations expect. Message 124148 - Posted: 2 Jan 2019 | 22:30:03 UTC - in response to Message 124111. I tried the instructions for "multithreading optimization instructions". When I select Option->Read Config Files it doesn't indicate (via a check mark or anything else) thait is selected. This is on a quad-core. On the off chance that there is no visual indicator, I have placed three tasks in "suspend" mode and the remaining task is only using one core. Message 124161 - Posted: 3 Jan 2019 | 2:35:21 UTC - in response to Message 124158. There's no visual indicator, it will tell you in the event log. If I remember correctly, changing number of threads requires you to close and restart BOINC to have it take effect immediately. Message 124162 - Posted: 3 Jan 2019 | 3:49:10 UTC - in response to Message 124161. I tried that. Multiple times. I feel like I've missed something else? Are you sure you closed BOINC for good and not just the GUI? Make sure the exit dialogue pops up and check the box that stops computation along with closing the client. Message 124177 - Posted: 3 Jan 2019 | 12:08:47 UTC - in response to Message 124161. When I select Option->Read Config Files it doesn't indicate (via a check mark or anything else) thait is selected. This lets <avg_ncpus> take effect immediately. I.e. boinc-client will assume that this type of tasks will occupy avg_ncpus when running. Right, or in other words: A shutdown and restart of the boinc client makes the <cmdline> part take effect on already started tasks. Alternatively, you can switch "Leave non-GPU tasks in memory while suspended" off, suspend an LLR task which you want to reconfigure, just to be sure check in task manager that the task was indeed suspended, then resume the task. Message 124179 - Posted: 3 Jan 2019 | 12:11:31 UTC - in response to Message 124162. Message 124206 - Posted: 3 Jan 2019 | 17:33:07 UTC - in response to Message 124106. While it is appreciated that the only participants likely to have any chance of winning are those with highly performant machines, it is still fun for those of us with more modest setups to participate. The problem with the last few challenges is that the assigned tasks are so large and take so long on our machines that we cannot complete even one task in the time allocated. It is more pleasurable for us lowly amateurs to participate if we have the chance of getting *some* placement on the scoreboard. We would hate to feel we were somehow a nuisance, getting in the way of the serious competitors, in the way that small children at a skateboard park get in the way of the big boys. However, if the admins decide that our efforts are not really needed on these challenges, we can stay clear if that is best. Message 124213 - Posted: 3 Jan 2019 | 18:33:36 UTC - in response to Message 124206. Message 124218 - Posted: 3 Jan 2019 | 19:18:41 UTC - in response to Message 124206. I think that's going to be true regardless of the challenge particulars. The more / bigger hardware you throw at it, the more / higher you will score. It is more pleasurable for us lowly amateurs to participate if we have the chance of getting *some* placement on the scoreboard. I'm running a 9-year old CPU. I will complete at least one unit in this challenge, and likely more (barring a days long power outage, major hardware failure, meteorite hitting my home, etc). I honestly don't care about my placement in the challenge, but I do look at the scores for my name when it's done just to see where I'm at. We would hate to feel we were somehow a nuisance, getting in the way of the serious competitors, in the way that small children at a skateboard park get in the way of the big boys. However, if the admins decide that our efforts are not really needed on these challenges, we can stay clear if that is best. I don't understand how anyone could "get in the way" of anyone else. I believe there are way more than enough tasks to go around. We're not going to run out of them at any point during the challenge (unless we find all 5 remaining primes and prove the conjecture before it ends which is unlikely). My opinion is that every bit of effort is beneficial to the goal. The workunits all need to be checked eventually. Maybe you only check one while the next person checks five. That's fine, they all need to be checked eventually, and as a group, checking six is more than checking five. Message 124219 - Posted: 3 Jan 2019 | 19:36:23 UTC - in response to Message 124206. While it is appreciated that the only participants likely to have any chance of winning are those with highly performant machines, it is still fun for those of us with more modest setups to participate. The problem with the last few challenges is that the assigned tasks are so large and take so long on our machines that we cannot complete even one task in the time allocated.. The laptop is a Haswell Core i3, like your desktop, but it runs at 1.7 Ghz -- less than half as fast as your computer. This is the challenge task it ran: https://www.primegrid.com/result.php?resultid=953413367 The run time was 523,528 seconds, or about 6 days. I was able to run only one task on that computer. Your computer is more than twice as fast as my laptop, and you should have been able to run at least two tasks. Those numbers are correct as long as you took the time and put in the effort to configure your computer for maximum performance. It is a "challenge", after all. For GFN21 CPU tasks, such as the last challenge, and large LLR tasks, like the next challenge, that means configuring BOINC to not use the hyperthreads and to use the multi-threading capabilities available in the latest versions of those apps. Instructions for setting up multi-threading are included in the introductory message in each forum challenge thread. However, while you personally were using a computer that is fast enough to have completed some tasks in the last challenge (and even more in the next challenge), it's indeed true that there are some computers that are too slow. Not everyone is going to be able to participate in every challenge. Message 124222 - Posted: 3 Jan 2019 | 20:02:59 UTC - in response to Message 124219. Point taken. I'll leave the games to the big boys. Message 124223 - Posted: 3 Jan 2019 | 20:15:56 UTC - in response to Message 124222. That was not my point at all. In fact, it's the polar opposite of what I said. I participated with a computer less than half as fast as your computer. And this was the most difficult challenge we've ever run. While there are indeed some computers that are too slow -- that would be true no matter where we set the bar -- the bar is actually set very low. Almost any computer with a discreet GPU *OR* with AVX *OR* with at least 4 cores should have been able to participate. Probably a lot of computers that don't meet any of those conditions could have participated as well, but any machine with at least one of those should be able to have made the 10 day deadline. How does one properly benchmark SOB? For instance, I had a WU set to 4 cores. The remaining time was 3d 11h. Then I changed that same WU to 36 cores and it still says the exact same time is left, 3d 11h and counting. I expected at-least a couple of hours shaved off with such an increase in cores...? Message 124230 - Posted: 3 Jan 2019 | 21:43:04 UTC - in response to Message 124228. That does bring a question up. If you change the cores - I'm guessing via the app_config file but use the same work unit, isn't the workunit still looking at only using the number of cores it was originally downloaded as? Message 124232 - Posted: 3 Jan 2019 | 22:19:36 UTC - in response to Message 124228. First of all, to get the app to actually switch, it needs to stop. The simplest way to do that, and be certain you're doing it right, is to reboot your computer. Yes, there's easier ways to do it, but if you're not familiar with what you're doing, you might end up thinking you restarted it without actually doing so. If you reboot, you know for certain the app was stopped and started. But there's a bigger problem. The estimate BOINC shows you is based on its run time so far, so after you change the number of cores, it's basing its time estimate on a hybrid of the old setting and the new setting. That number is therefore worthless to you. To see how long it's going to take, I run LLR by hand from a command line and look at the iteration timings that it displays. It's expressed in milliseconds, so you need to divide that number by 1000 and then multiply by the total number of iterations (which is displayed by LLR), and that gives you an estimate of the total runtime, in seconds. Important: don't use the first iteration timing since it includes initialization processing, and is artificially too high. Wait till at least the second timing at the 20,000 iteration mark. Message 124234 - Posted: 3 Jan 2019 | 22:36:03 UTC - in response to Message 124228. How does one properly benchmark SOB? I prefer "offline" testing with a fixed WU, i.e. running the LLR program stand-alone outside of BOINC with the very same input data in all tests. And since one SOB task takes far too much time = inappropriately many kWh per test, I stop the program after a fairly low percentage of completion. Using different random WUs in a test series, or making up a test series by suspending & resuming a task with varying configs, is too imprecise and error prone IMO. Maybe an area for future research, but Prime95 29.x benchmark at the appropriate FFT size might be a quick indicator of relative performance since LLR uses the same math library to do the hard work. You can choose how many workers (tasks) and cores, HT on and off. I don't know what the practical implications are but looking at my SoB test units they are using complex FFTs, so that option probably should be selected. I don't know how they differ from non-complex ones. Edit: I note in the WU output LLR version use 28.14. I do know there were some FFT selection optimisations at some point in 29.x so there may be differences due to that. I'd still lean to using 29.x over 28.x as the updated interface makes it a LOT easier to test at will without having to manually edit config files. Edit 2: I further note LLR gives the gwnum version, which I don't know if it tracks the Prime95 version... well, test at your own risk! First and foremost, Windows 10 will by default add a ".txt" extension when you select New->Create Text Document within Windows Explorer. That means the created file has a ".txt" extension. So when I created app_config.xml I was actually creating app_config.xml.txt. Doh! Regarding restarting PrimeGrid: just reboot. Keeps things simple. Regarding checking the Event Log: good suggestion. It resolved the first mystery I noted above. Just look for the entry "Found app_config.xml". If I had my druthers I'd configure the app_config.xml to always run every LLR with as many (real) cores as on my machine. Doing it one-by-one - and specifying the number of cores every time - is a bit cumbersome. I wonder if anyone has any easy method for doing this? I'm currently running three different boxes with SOB tasks using all available (real) cores. I'll post my run-times when I get a few under my belt, in case anyone is curious. Message 124278 - Posted: 4 Jan 2019 | 10:10:10 UTC - in response to Message 124234.
llr has a -d command line option that shows the measurement of "time per bit". You have to wait for 20000 bits (second update it gives) for a better measurement as the first one has init/windup time. Or maybe the third update. llr64 -t4 -d -q"21181*2^28659332+1" "-oForcePRP=1" "-oFermatPRPtest=1"
Maybe an area for future research, but Prime95 29.x benchmark at the appropriate FFT size might be a quick indicator of relative performance since LLR uses the same math library to do the hard work. While this method has its drawbacks, I guess it is one element of Czech National Team's recent good successes. I'm currently running three different boxes with SOB tasks using all available (real) cores. I am patient enough to run a lot more iterations than these, for better precision. Such short tests vary too much to provide insight into cases where the performance does not differ a lot between different settings. In each chart below, count is the number of validated tasks and elapsed and cpu are the fastest times in hours, with the fastest at the top. Each table is for a particular number of threads. I checked from 100 to 2 threads. If a thread count isn't shown, there's no validated tasks that were run with that number of threads. The table only counts tasks sent out in the last 60 days, which will primarily be tasks in the current n=28M range. Note 1: a task that was stopped and continued with a different number of threads will show up in both tables. Note 2: You'll notice that some lines have a CPU time that is identical to the elapsed time. This is probably due to the way that host's BOINC client is configured. Really good data as usual and in spite of various minor shortcomings. Message 124348 - Posted: 5 Jan 2019 | 14:30:36 UTC - in response to Message 124336. Message 124350 - Posted: 5 Jan 2019 | 16:59:35 UTC - in response to Message 124336. Regardless, very useful benchmarks and your efforts are tremendously appreciated! Message 124364 - Posted: 5 Jan 2019 | 23:29:55 UTC - in response to Message 124350. Could Kaby Lake be that more efficient on a slower CPU? 1.) There is only a single task for the i5 in the sample. Remember that there is a considerable variation in size of the tasks that were in circulation during the last 60 days. 2.) We don't know what the i7 owners ran concurrently with the 4-threaded SoB tasks. For all we know, they had GPU tasks going in addition. So the answer is: We cannot conclude anything at all from the two records which you quoted. But yes, memory performance does have effect on SoB-LLR performance. I tested with different RAM configs, but this was long ago with the v7 application. And remember: If the boinc client fetched more than one task in a single request for more work, then the run time of multithreaded tasks which gets recorded at the server when finished gets semi-randomly corrupted. Message 124388 - Posted: 6 Jan 2019 | 15:47:11 UTC - in response to Message 124336. In each chart below, count is the number of validated tasks and elapsed and cpu are the fastest times in hours, with the fastest at the top. Each table is for a particular number of threads. To reiterate, the values in elapsed and cpu-time are the single best runs out of the corresponding 51 and 17, correct (may be different ones for two columns)? Not the average of these 51 and 17 runs and then the whole table is sorted by elapsed? I ran benchmarks in preparation to the challenge on my (recently built) i7-9700K and I just don't see getting lower than about 20-21 hours. And these "older" cpus got 18-19?.. Being just single "lucky" best values (rather than the average) can be explained by BOINC messing up run times in some cases (it's possible sometimes – with tasks being suspended and client restarted and stuff – to have run time "restart" and then boinc reports the value which was lower than the real one). The memory is a bottleneck for SOB, so my explanation#2 is maybe these people had faster memory sticks than i do? (frequency and/or latency). I didn't go crazy price max top existing, but I thought I still got fairly "competitive" ones. My explanation #3 is that I ran the test with a leading edge (max in progress) number from the stats and the "lucky" runs could probably be for numbers from n=26M range (which still had active tasks 60 days ago, so might've got into Michael's tables). It would ease my worries if you could look up average elapsed for these two rows (in case it was indeed single best values) and tell me that the averages there are more like 23-25 hours. Message 124390 - Posted: 6 Jan 2019 | 17:35:21 UTC - in response to Message 124388. Correct. Definitely NOT the average. The average includes so much noise that it's absolutely worthless. Consider the elapsed time value being inflated either because something else is eating 99% of the CPU time, or the "bug" whereby BOINC downloads multiple tasks when multitasking and multiplies the elapsed time by N. The fastest elapsed time is likely to be correct. The average elapsed time is garbage. I ran benchmarks in preparation to the challenge on my (recently built) i7-9700K and I just don't see getting lower than about 20-21 hours. And these "older" cpus got 18-19?.. It's not clear the Kaby Lake is really any slower than the latest chips. Certainly not significantly slower. My understanding is that the big advantage with the newer chips is more cores. Also, you have no clue at all what clock speeds and memory speeds are being used on anybody else's computers. Finally, read again what I wrote at the top of the tables. In particular, the part about tasks that were run with varying number of threads count in ALL thread counts. A task than ran for 10 hours with 18 threads and for 2 minutes with 2 threads would show up in both the 18 thread and the 2 thread tables. There's a LOT of noise and unknowns in the data, and you should not worry about any numbers that don't seem to make sense. I picked the calendar window (63 days) such that it started after we we moved to the 28M range, but it's possible some resends of smaller tasks were included in the data set. Even within the 28M range, however, there's going to be a difference in runtimes between 28.0M and 28.5M, which is about where we are today. And, of course, depending on which K you have, there are two different FFT sizes. That changes the run time significantly. When you did your benchmarks, were you using the 2560K FFT or the 2880K FFT? I benchmarked my systems with both sizes. I will try running it again and explicitly excluding anything below 28M. If the results are different, I'll post a new table. Message 124391 - Posted: 6 Jan 2019 | 17:38:36 UTC - in response to Message 124364. Good points to consider. Thank you for adding some more color to the charts. Note that some time has passed between the previous tables and these, and it's possible some tasks have been purged from the database during that time. It's not a certainty that changes are due to excluding tasks below 28M. Message 124400 - Posted: 6 Jan 2019 | 19:41:54 UTC - in response to Message 124390. Hmm, only 2560K. I'll consider rerunning everything with a 2880K FFT number, but I feel like the relative values of different combinations I tried (1x8, 1x4, 2x4, 8x1 etc.) would be the same, just scaled up. So my decision on how to run the challenge would stay the same. Hah, I see the the i7-7700K 18.1h result that I was "worried" about disappeared in the new data. Might've been a purged old WU, but I'll hold the view that it was a smaller number (actually, an old WU would most likely be a smaller number either way). The other 19.8h one is more within my 20-21h expectations. Especially with 28.0M-28.5M difference you noted. So I'm relieved. Good luck in the challenge, everyone! About 10 hours remaining. Let's uncover some primes in those no-res double checks. Message 124402 - Posted: 6 Jan 2019 | 20:21:32 UTC - in response to Message 124400. That would be my conclusion as well. I've run a trial task with multithreaded on and aborted it. Ready to switch over to SoB when I come home from work tonight. Aiming to get 2, maybe 3 WU's done over the Challenge duration. Every little bit helps. Message 124410 - Posted: 7 Jan 2019 | 1:50:23 UTC - in response to Message 124407. The challenge has started. Good luck everyone! I'm trying 1x4t SoB task by i7-4770k. I believe my 4-year-old AiO (Corsair H80i) is gone. Message 124431 - Posted: 7 Jan 2019 | 13:03:44 UTC - in response to Message 124424. Your temps are fine, I wouldn't have recommended an H80 but you're under-clocking the CPU so it works out. I'm seeing the same temps on a 4770K @ 4.00 GHz running PSP using a Corsair H110. I would normally be running a higher OC and temps would be ~80C 24/7 only running @4GHz this winter because I got tired of fan noise. Well, I have chosen the right frequency to get good temps. This cooler was able to afford 3.5GHz some time ago, turbo boost ON (3.7GHz) too. I recently changed thermal paste without improvements. I think the cooler itself is getting worse. Now @3.5GHz reaches 84°C, then there is throttling. Anyway I let the i7-4770k @ 3.0GHz (ram 1866MHz) run a bit. It should complete this task in ~35h at this "speed". FFT is 2560k. However, I could have to decrease frequency when I'm close to this host because of noise. So final time will be higher. The first task has been returned in just over 7 hours! Message 124441 - Posted: 7 Jan 2019 | 14:22:00 UTC - in response to Message 124438. The last SOB task I crunched took 30 hours. Message 124448 - Posted: 7 Jan 2019 | 15:54:26 UTC - in response to Message 124438. Dang... What was the hardware? I hope he or she keeps going at that pace. Message 124449 - Posted: 7 Jan 2019 | 16:12:23 UTC - in response to Message 124448. Message 124450 - Posted: 7 Jan 2019 | 16:17:02 UTC - in response to Message 124448. The current leading edge (i.e., latest work unit for which work has actually been sent out to a host) is n=28911812. The leading edge was at n=28712732 at the beginning of the challenge. Since the challenge started, the leading edge has advanced 0.69% as much as it had prior to the challenge! I'm making a change in the statistics. Because BOINC tends to send extra tasks when you're multi-tasking, and many people abort those extra tasks, I decided to break aborted tasks in a separate line instead of including them in errors. As you can see above, instead of having 784 errors, we have 762 aborted tasks and only 22 errors. That paints a very different picture! Notice how most of the aborted tasks are on CPU tasks (which could be multi-threaded), while most of the errors were on GPU tasks. Message 124454 - Posted: 7 Jan 2019 | 16:39:27 UTC - in response to Message 124424. I have with my own H80 (v1) which was my first foray into the "wonderful" new world of CLCs. After many years of running my first 3930k OC at very reasonable temps I started noticing my task times being higher than that of my non-overclocked 3930k and looked to see it running well under speed at 90+C. Judging by the corrosion, I think it started a small leak around the copper plate and now hardly has any liquid in it (it's in my recycle pile). My advice to you is replace that cooler ASAP before the worst happens. Since any computer in my house will run PG until it is no longer working or viable, I've abandoned CLCs and only use air cooling on my systems, mainly the biggest Noctua cooler that will fit into the case--I have 10 year old U12's still running cool and quiet 24/7. I'm looking at custom WC for my next-gen Core-X build, but that will sit on my desk where I can monitor it. Message 124457 - Posted: 7 Jan 2019 | 16:59:42 UTC - in response to Message 124449. Message 124458 - Posted: 7 Jan 2019 | 17:03:40 UTC - in response to Message 124453. 1. Set your buffer to zero. Message 124459 - Posted: 7 Jan 2019 | 17:31:53 UTC - in response to Message 124458. There are times when you WILL get more than one task as defined by your config file downloaded. This happens almost every time I start a new project on which I've added it to my app_config file. Not sure why but I'm guessing the first time through the pc is not smart enough to have it only download the "requested" number of tasks. This has happened every time for me. Once I've actually run and sent back a task, the remainder of the time I only get what I think I should. Message 124460 - Posted: 7 Jan 2019 | 17:35:07 UTC - in response to Message 124458. That's certainly a viable option. However, many people just abort the tasks, so... there's lots of aborted tasks, and it makes sense to report actual errors and aborts separately. Message 124461 - Posted: 7 Jan 2019 | 17:36:56 UTC - in response to Message 124458. Don't you also need to have BOINC computing preferences set to "Use at most 16.67% of the CPUs"? Message 124462 - Posted: 7 Jan 2019 | 17:39:16 UTC - in response to Message 124461. No, since he set ncpus to 2. This tells BOINC to only use 2 CPU cores in total. I set BOINC prefs to 1% CPU & that works the same as 25%. Message 124465 - Posted: 7 Jan 2019 | 18:22:58 UTC - in response to Message 124462. That's it. 2 (virtual) cores with 6 threads each. Message 124468 - Posted: 7 Jan 2019 | 18:42:09 UTC - in response to Message 124465. With the old server (Rackspace) the CPU time was calculated correctly. I don't use WU-Prop but "top" shows the CPU time correct. Message 124477 - Posted: 7 Jan 2019 | 19:39:40 UTC - in response to Message 124454. Copper plate is a bit oxidized where it doesn't overlap the CPU IHS. Copper is shiny where there was thermal paste. Cracks in rubber connections appeared. Tubes are made of some plastic material instead, so they are still perfect. Luckily, I didn't find any important/visible leak. LOL! I have exactly a Noctua cooler. It's the Noctua NH-L12 which I substituted for Corsair H80i and finally I didn't sell. I should get a larger case to move to bigger coolers. Message 124486 - Posted: 7 Jan 2019 | 22:18:38 UTC - in response to Message 124462. I think this is where the disconnect is. All the "how to multi-thread" that I've seen (until now) has only dealt with app_config. Using app_config only, BOINC knows how many CPUs you have and what % you want to use (to determine how many tasks to get). It doesn't look into app_config until it's ready to run a task that's already been downloaded. Not sure how this "fixes" itself for those leaving it at 50% or 100% CPUs. I suspect that after finishing a task it initially only asks for 1 task as a replacement (as opposed to the start-up having no tasks at all), new task starts, uses all the CPUs and it doesn't ask for any more. Message 124487 - Posted: 7 Jan 2019 | 22:37:04 UTC - in response to Message 124468. Unfortunately WuProp does not recognize multi-thread, it's counted as straight time, but since it does take into account the number of instances; running 3 concurrent PPS Sieves on 1 GPU for an hour shows as 3 hours run. Message 124488 - Posted: 7 Jan 2019 | 23:25:27 UTC - in response to Message 124448. I saw that... damn. fast! For some time now, I too have been using <avg_ncpus>1</avg_ncpus> for all MT applications at PrimeGrid and for some MT applications at other projects, in order to have the client download only the desired amount of tasks. This method is only viable though if you don't run tasks with different thread counts at the same time (in the same client instance). But I never do this anyway, as I am not satisfied with how the client schedules tasks then. I am not specifying <max_concurrent> nor <project_max_concurrent>. Neither of these effects how many tasks the client requests when fetching new work. I control the total number of concurrent tasks either with cc_config.options.ncpus or with global_preferences.max_ncpus_pct (usually set via boincmgr GUI), and I tend to prefer the latter. I have a single computer running in this competition, which completed 6 tasks yesterday. It fetched them in requests of 2 + 1 + 1 + 1 + 1 tasks, and ran them as 2...4 tasks concurrently. (I reconfigured the host during the day from best run time to best throughput.) As it happens, results.php is showing "run time" as well as "CPU time" correctly for all six tasks. I haven't seen "CPU time" misreported with any of my hosts yet, neither now nor whenever I checked last year, even though I set <avg_ncpus>1</avg_ncpus> and am running more than one task at once in the same client. Message 124513 - Posted: 8 Jan 2019 | 12:39:48 UTC - in response to Message 124511. I use the same method, and the main issue is when switching from tasks with few threads to tasks with more threads, i.e. from SGS (-t 1) to SOB (-t 4). As soon as the first SGS finished, BOINC dowloads a single SOB and puts the 3 other SGS on hold. I usually suspend manually the SOB task for a few minutes, so as to let the remaining SGS finish. The current leading edge (i.e., latest work unit for which work has actually been sent out to a host) is n=28989391. The leading edge was at n=28712732 at the beginning of the challenge. Since the challenge started, the leading edge has advanced 0.96% as much as it had prior to the challenge! Has links to other info, full user/team rank lists. Anywhere you see a user/teamname they're hyperlinked to see a graph of that user/team's score over time during the challenge. Everything there should stay updated every 15 minutes, as the primegrid challenge pages are. Message 124531 - Posted: 8 Jan 2019 | 18:20:16 UTC - in response to Message 124529. The double check is now 57% complete, and we've started sending out tasks with n>29M. Message 124563 - Posted: 9 Jan 2019 | 3:47:50 UTC - in response to Message 124448. NOTE: We are double checking old SoB work and tasks may be much shorter than typical SoB tasks. Message 124564 - Posted: 9 Jan 2019 | 4:24:51 UTC - in response to Message 124554. By number of tasks, or by estimated time to completion? I assume the former; can you estimate the CPU time percentage complete? Message 124566 - Posted: 9 Jan 2019 | 5:54:22 UTC - in response to Message 124563. Actually, that message is pretty old. I'll remove it. That tasks are back to being very long. Not quite as long as the leading edge tasks would be, but close. Message 124567 - Posted: 9 Jan 2019 | 5:55:39 UTC - in response to Message 124564. That percentage is based on estimated total computing time. The current leading edge (i.e., latest work unit for which work has actually been sent out to a host) is n=29019934. The leading edge was at n=28712732 at the beginning of the challenge. Since the challenge started, the leading edge has advanced 1.07% as much as it had prior to the challenge! Message 124590 - Posted: 9 Jan 2019 | 15:01:50 UTC - in response to Message 124424. FWIW, I am running 6 threads on an 8700K @ 5 GHz under an H80iV2 and my temps are in the low to mid 70s. Message 124604 - Posted: 9 Jan 2019 | 17:38:23 UTC - in response to Message 124590. I'm running 7 cores (hyperthreading turned off) on my 9900K @ 4.6Ghz under an H115i. My hottest core is at 95C, my coldest core in use is 90C. The unused core is at 80C, probably just from close proximity of the other cores in use. Current TDP is bouncing between 160watts to 165watts. So, yea... 70 is not hot. Also Intel's Tuning utility shows that there is no throttling on this system. And if anyone is interested my current SoB task is 24.9% complete at an elapsed time of 3 hour, 20 min. This task seems to be running much faster than my previous tasks, but this was after I tweaked some things. Message 124605 - Posted: 9 Jan 2019 | 17:49:35 UTC - in response to Message 124604. Those kind of temperatures make me think a delidded 8700K / 8086K is a better proposition in the long run. Message 124606 - Posted: 9 Jan 2019 | 18:07:04 UTC - in response to Message 124605. Oh I totally agree it's pushing it. Stressing it for this task to see how fast I can complete it. Anyway, my old system was a delided 7700K. I wouldn't trade my 9900 for anything. It's a monster. Message 124608 - Posted: 9 Jan 2019 | 18:09:51 UTC - in response to Message 124605. My i7-920 peaked at 101C with stock cooler before using a better one. That system had weekly resets and freezes for a while. The CPU figuratively gave up the smoke after 6 years of abuse on Primegrid. It was time to get something better anyway. Message 124616 - Posted: 9 Jan 2019 | 21:05:13 UTC - in response to Message 124608. I'm seeing images of Beavis saying "fire! FIRE!" Message 124619 - Posted: 9 Jan 2019 | 22:05:33 UTC - in response to Message 124606.
not even for a board of 8x Xeon Platinum 8180M? Message 124623 - Posted: 9 Jan 2019 | 23:09:22 UTC - in response to Message 124622. I've never used Be Quiet! but I understand they are quality parts. Noctua is about as good as it gets, fan wise; my rig is decked out with the new A12s (I think thats the part, I'm too lazy to look it up). If you can find a copper heat sink suitable to your case / TDP needs, you will get significantly better heat dissipation than aluminium. Message 124624 - Posted: 9 Jan 2019 | 23:32:57 UTC - in response to Message 124623. Current aggregate score of participants in this Challenge without a team (9 individuals) is 9th place, at 2 163 651.99 representing 3.69% of the total score. EDIT: or is it, Go Team ""! Hmmm, an empty string is not the same thing as NULL. To be consistent with the Top Teams list, it would be 8.5th place. The current leading edge (i.e., latest work unit for which work has actually been sent out to a host) is n=29065090. The leading edge was at n=28712732 at the beginning of the challenge. Since the challenge started, the leading edge has advanced 1.23% as much as it had prior to the challenge! Message 124662 - Posted: 10 Jan 2019 | 15:01:34 UTC - in response to Message 124646. Haha! "Team Remainder," maybe? "Team != exists"? Everyone who does not belong to a team should be made a member of "Team Null" by default. The current leading edge (i.e., latest work unit for which work has actually been sent out to a host) is n=29094884. The leading edge was at n=28712732 at the beginning of the challenge. Since the challenge started, the leading edge has advanced 1.33% as much as it had prior to the challenge! Wow, teams at 1st and 2nd sooooo close it's hard to call. Only 1/3rd into it and It's so evenly matched it's going to be, probably, the most interesting challenge in years!!! The double check is now 58% complete. Message 124727 - Posted: 12 Jan 2019 | 5:44:18 UTC - in response to Message 124682.
the leading edge has advanced 1.33% as much as it had prior to the challenge! I am not quite sure what you are meaning by ^^ are you are saying the project is progressing at the same speed as before the challenge started? Message 124729 - Posted: 12 Jan 2019 | 8:07:45 UTC - in response to Message 124727. Nah - it's much faster. Message 124733 - Posted: 12 Jan 2019 | 9:59:46 UTC - in response to Message 124727. It's saying that, during the 4 days of the challenge, the project advanced the leading edge by 1.33% as much as it had been advanced in all the time prior to the challenge. The current leading edge (i.e., latest work unit for which work has actually been sent out to a host) is n=29128366. The leading edge was at n=28712732 at the beginning of the challenge. Since the challenge started, the leading edge has advanced 1.45% as much as it had prior to the challenge! Message 124749 - Posted: 12 Jan 2019 | 22:11:29 UTC - in response to Message 124733. Thank you both for the answers. I still don't fully understand what you mean. I understand it is progressing faster. Message 124751 - Posted: 12 Jan 2019 | 22:52:19 UTC - in response to Message 124733. It means that to accomplish the same feat %-wise next year, it would require much greater processing power than is being applied during this challenge because more work will have been done before the next challenge starts. Message 124753 - Posted: 12 Jan 2019 | 23:20:37 UTC - in response to Message 124733. Putting a number to "all the time prior to the challenge" might help. I assume in this case it means when the double-check started? When was that? Message 124754 - Posted: 12 Jan 2019 | 23:42:15 UTC - in response to Message 124753. There's actually two answers to this. The simpler one is what you said -- since the beginning of the challenge. But it also could mean "since the beginning of the SoB project", although that's more complicated because that originally went further. In the first case, It's comparing the last 5 days to the last 34 months. In the second case, it's comparing the 5 days to the years 2002 through approximately 2015. EDIT: This is a a script I run for every challenge, and it only measure how far the leading edge advances. It's not a measurement of how much work is done. Tasks increase in size significantly as the leading edge advances, which means the amount of computation needed to advance the leading edge now is much greater than the amount of computation needed to advance the leading edge at the beginning of the challenge. For everyone thinking about WUprop-hours being miscalculated. That is for a usage of 8 cores, and a single instance of SOB. Runtime ~31 Hours on a ryzen 1800x (reporting ~250 Hours on wuprop). seems the Thing is you have to tell BOINC how much cores it uses for WUPROP to properly read runtimes. Message 124765 - Posted: 13 Jan 2019 | 6:05:07 UTC - in response to Message 124754. Since, as you said, tasks are much larger than at the beginning of the project, and since computation power is generally greater than in the past, would it make since (and be easy to implement in the script) to say, "Since the challenge started # days ago, we've done x amount of work on the project. In the # days prior to the challenge we did y amount of work on the project." I feel like comparing the more recent, non-challenge time, to the challenge time, would give me a better feeling for what the challenge is accomplishing vs not having the challenge. The current leading edge (i.e., latest work unit for which work has actually been sent out to a host) is n=29171407. The leading edge was at n=28712732 at the beginning of the challenge. Since the challenge started, the leading edge has advanced 1.60% as much as it had prior to the challenge! Message 124771 - Posted: 13 Jan 2019 | 10:38:24 UTC - in response to Message 124765. Indeed it would, but that's beyond the capability of that script. I usually say some encouraging words about how fantastic participation is during this challenge, but this time it's difficult. Not because you'all are not doing a fantastic job -- you are -- but because it's particularly difficult to measure it this year for a variety of reasons. So I found a different way. During last year's challenge, it was easy to measure the effect of the challenge against the progress of the double check. I record each 1% increment in the amount of the double check that's completed, so we can measure the number of days between increments. The effect of the challenge last year was crystal clear, but that metric won't work as well in 2019. I can, however, compare this year to last year. 6280 (35%) have returned a successful result. 3228 (26%) have returned a successful result. We've done half as many tasks this year... but the tasks are almost 4 times longer now than they were a year ago, so we're doing close to double the computations that we did in 2018's challenge!!! Would it be possible to add the number of tasks to the challenge stats? Message 124788 - Posted: 13 Jan 2019 | 18:35:13 UTC - in response to Message 124783. Message 124790 - Posted: 13 Jan 2019 | 20:23:15 UTC - in response to Message 124788. Message 124791 - Posted: 13 Jan 2019 | 20:26:20 UTC - in response to Message 124790. Message 124792 - Posted: 13 Jan 2019 | 20:43:10 UTC - in response to Message 124790. Message 124793 - Posted: 13 Jan 2019 | 21:16:45 UTC - in response to Message 124790. Message 124794 - Posted: 13 Jan 2019 | 21:33:26 UTC - in response to Message 124790. The current leading edge (i.e., latest work unit for which work has actually been sent out to a host) is n=29199271. The leading edge was at n=28712732 at the beginning of the challenge. Since the challenge started, the leading edge has advanced 1.69% as much as it had prior to the challenge! The double check just passed 59% complete! Message 124810 - Posted: 14 Jan 2019 | 8:38:14 UTC - in response to Message 124790. Nice! Will it stay "forever" after completion of this challenge, or just while the tasks are still on the server? I see the December 2018 challenge stats also has task counts now, but other historical challenges do not. Message 124816 - Posted: 14 Jan 2019 | 11:48:29 UTC - in response to Message 124810. We're sill in the cleanup phase for the December challenge, so those reports continue to be generated. That's why they have task counts. The reports prior to that are no longer generated, and it's a good thing they're not: those tasks are purged, so if those reports were ever generated again, all their contents would be erased. Message 124827 - Posted: 14 Jan 2019 | 18:51:07 UTC - in response to Message 124775. When I compared a few days ago, it did not at all appear as if double the credit was earned in this challenge though. The current leading edge (i.e., latest work unit for which work has actually been sent out to a host) is n=29227942. The leading edge was at n=28712732 at the beginning of the challenge. Since the challenge started, the leading edge has advanced 1.79% as much as it had prior to the challenge! Message 124835 - Posted: 14 Jan 2019 | 19:50:33 UTC - in response to Message 124828. Message 124837 - Posted: 14 Jan 2019 | 21:03:19 UTC - in response to Message 124835. Message 124840 - Posted: 14 Jan 2019 | 21:18:15 UTC - in response to Message 124837. I intended to get the other projects closer to tipping point so I'd sorta get everything at once. Managed to do that with 321, but the others are a bit aways from the next upgrade. Message 124853 - Posted: 15 Jan 2019 | 6:29:54 UTC - in response to Message 124794. The current leading edge (i.e., latest work unit for which work has actually been sent out to a host) is n=29258698. The leading edge was at n=28712732 at the beginning of the challenge. Since the challenge started, the leading edge has advanced 1.90% as much as it had prior to the challenge! The double check is now 60% completed! The current leading edge (i.e., latest work unit for which work has actually been sent out to a host) is n=29305183. The leading edge was at n=28712732 at the beginning of the challenge. Since the challenge started, the leading edge has advanced 2.06% as much as it had prior to the challenge! The conjunction: This month’s conjunction is one of the wider groupings for the pair for this decade: at their closest, Venus passes 144.4 arcminutes (almost two and half degrees, or the span of five Full Moons) from Jupiter at ~12:00 Universal Time (UT) on the 22nd. These sorts of passages of the two brightest planets in the sky happen roughly once a year… except for 2019, which features two, including a closer 84.3 arcminute pass on November 24th. That’s the final one for this decade, as 2020 (like 2018) is devoid of close Jupiter-Venus conjunctions. Be fortunate enough to be alive on November 22nd 2065, and you'll actually see Venus transit in front of Jupiter. 10 days done. 5 to go. Two thirds of the challenge is complete! The current leading edge (i.e., latest work unit for which work has actually been sent out to a host) is n=29340490. The leading edge was at n=28712732 at the beginning of the challenge. Since the challenge started, the leading edge has advanced 2.19% as much as it had prior to the challenge! Message 124930 - Posted: 17 Jan 2019 | 9:47:25 UTC - in response to Message 124005. Extremely low score (42 726.89) for 'Bommer' – how come? Very old returned task? Message 124936 - Posted: 17 Jan 2019 | 11:46:36 UTC - in response to Message 124932. Exactly right. This was a task originally sent out to two computers on October 18th of last year. One of those was computed at a leisurely pace and returned on November 7th and the other's processing was positively glacial and wasn't returned until January 13th. To add insult to injury, the two results did not match, so a third task was sent out, this time to Bommer, who completed it correctly in two days. The number tested by these three computers was quite a bit smaller than current tasks, with n in the 26M range and a 2304K FFT size. In case you're wondering, it was the slow task that took 3 months to finish that was incorrect. THanks to this challenge, the double check has reached 61% complete!